I live near Caochangdi, an urban village where Telescope and many other contemporary Beijing galleries are located. Last spring as I rode my bike along the Airport Expressway service road on my way to Telescope, I noticed a green tent by the side of the road. It had a wooden front door and was facing the highway service road, situated at the outside edge of Wang Jing Park. There were a couple of chairs and tables outside and many old painted wooden boxes in the grass around the tent. Last April a family moved in to this no man’s land between a city highway along its service road and a park, and they set up shop with a tent and 20+ beehives. A father, mother, and their little daughter have been living and working there since the spring and will be there for over half the year keeping their bees and selling their honey. Every time I saw their daughter, she was dressed very nicely in little fancy ballerina-style dress with a lace bodice and a long tulle skirt. Once I saw her sitting at a small table under the trees while the mother served her lunch. The scene was so touching and intriguing to me. I wondered where these people were from. Why did they come here? My gallery, Telescope, is in an urban village where you see things that you do not normally see in a city. This was another one. After passing by many times over a few weeks time, I stopped to chat with them. Sometimes the father was at home checking on the beehives, but most of the time just the wife and their young daughter were there. My Mandarin (Putong Hua) is still rather rudimentary, but oftentimes even Mandarin fluency cannot not help you with the local dialects. Most of the people in the village they are from are beekeepers. Every spring they go to different areas with their hives to find flowers and customers for their honey. 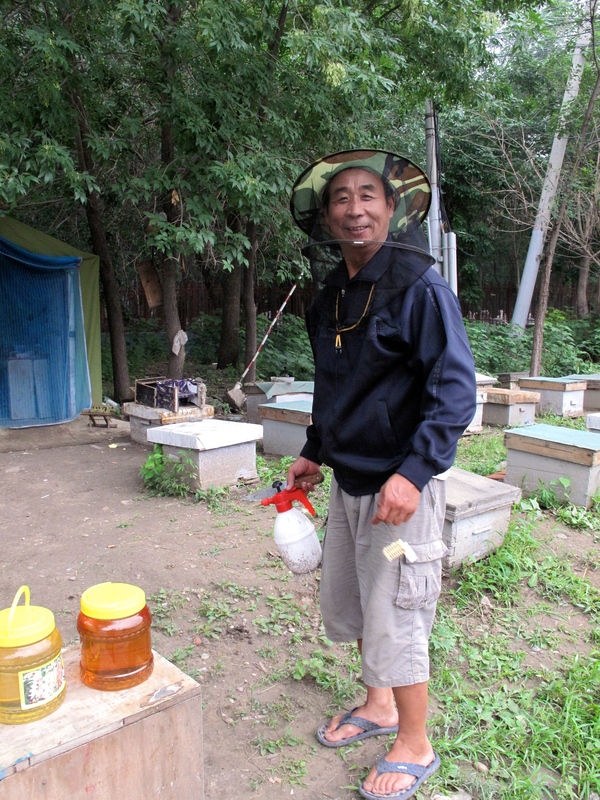 This family had several hive locations in Beijing, and they knew just how many hives per location they could have to avoid trouble with the authorities. I noticed that the little girl liked to draw and color so I brought her some coloring books, markers, and colored pencils. She was elated. In November they will return to Henan, a province to the south of Beijing, for the winter and wait for the next year and the spring flowers of Beijing. In 2008, Hammer Projects curator James Elaine relocated to China. He has since settled in Beijing and opened the nonprofit art space Telescope. Jamie is our feet on the ground and bring us his musings on art, life in China, and anything else that might strike his fancy.